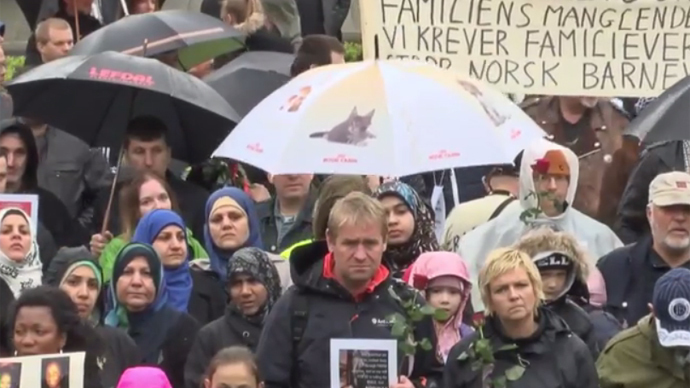 Hundreds of demonstrators gathered in the Norwegian capital Oslo, to protest against the country’s foster care system. They are angry at children being ‘kidnapped’ from their families, which the protesters say is a breach of family rights. Driving rain in Oslo didn’t put the several hundred protesters off from making their viewpoint heard, as they assembled by the city’s Central Station, before marching towards the parliament building. Banners were held aloft, with messages including: “Children are not business,” and, “Bring back our children.” They are angry at the Norwegian foster care system ‘Barnevernet,’ (Child Protection Service), which has seen families in the country lose their children for alleged abuses, such as accidently dislodging a child’s loose tooth. Eva Michalkova, who is originally from the Czech Republic, has felt the wrath of the Barnevernet, after she lost her two children. "It’s a mixture of feelings. It’s sadness, frustration, it’s a feeling you you don’t know what to expect and all you can say is used against you, all you can do is used against you. So it is very difficult,” she told RT’s Ruptly video agency. Michalkova’s case stems from an incident in 2011, when her two sons were taken into protective care, after one of her children told a nursery teacher that his father had “groped inside his pajamas,” the Norwegian online newspaper Nettavisen reported. No charges were ever brought over the incident, but the Barnevernet placed the children into two separate foster families. The children’s parents have since divorced, but Eva is fighting a legal battle to regain custody of her kids. "The boys are in a foster facility similar to Lebensborn. Their mother can meet them for 15 minutes twice a year. She must not talk in Czech to them. In other words, the kids are being estranged from their national identity," Zeman said, as cited by the Czech News Agency. In October 2014, the Barnevernet snatched the young son of a Russian couple after the child told classmates that his mother had pulled out a loose tooth. According to Natalya and Sergey Shianok, their son Oskar, who was five at the time, had told fellow kids at his school that his mother had accidently yanked out one of his baby teeth. Natalya explained that she was helping him to pull a T-shirt over his head and knocked out a tooth that was already loose. The Barnevernet said this was child abuse and that the mother had deliberately knocked the tooth out. “For the moment Oskar remains in the care of a Norwegian foster family, and his mother has no idea where,” says Igor Lapitsky, head of the Russian consulate in Norway, reports RadioVesti.ru. In comparison, former US athlete and Olympic gold medal winner, Bryan Clay won praise from across the internet, when he tied a piece of dental floss to a javelin, which he then threw, to dislodge his daughter’s loose tooth. Marius Reikeras, a human rights activist is critical of the Norwegian government’s spending on Barnevernet, saying that the money could be more effectively channeled elsewhere. "We are putting a lot of money in the Child Welfare System. No country in the world puts more money per capita than the government when it comes to CPS. If we could help these families, if we could provide these families with the money we put into the CPS system instead, I am pretty much sure that we could help almost every family,” he said. Norway’s Child Welfare Services says on their website that they are committed to providing help and support to children, adolescents and parents who are experiencing challenges or difficulties within the family. The service adds that parents are responsible for providing care and protection for their children. “The Child Welfare Services must base its actions on the best interests of the child. Sometimes the child’s best interests conflict with those of the parents. The Child Welfare Services’ first duty is to provide help and support to the parents, so they can take good care of their children,” the service’s website said.